It may seem like a bit player in the U.S., but Alaska Airlines has long offered more flights between Hawaii and the mainland than any other carrier—yes, even more than Hawaiian Airlines. This is in addition to its extensive network throughout the West Coast and the State of Alaska. One of the best ways to book award travel on Alaska is actually using the British Airways Executive Club because the two are partners. Alaska doesn’t have fuel surcharges on any of its flights, so there’s nothing for British Airways to collect. Alaska’s network is also heavily focused on non-stop travel and so plays well with British Airways’ distance-based pricing scheme. * Beginning February 2, a single category will be available for flights of 1,151 miles or less within North America. Any flight less than 1,150 miles costs just 7,500 Avios. Flights less than 2,000 miles—including flights from any West Coast gateway to Hawaii—cost 12,500 Avios. Frequent travelers can earn more Avios points through the Chase British Airways Visa credit card or by transferring Membership Rewards and Ultimate Rewards points earned with other credit cards. There is one major flaw in this strategy: British Airways does not display any Alaska Airlines flights on its website. You’ll need to do the legwork yourself. 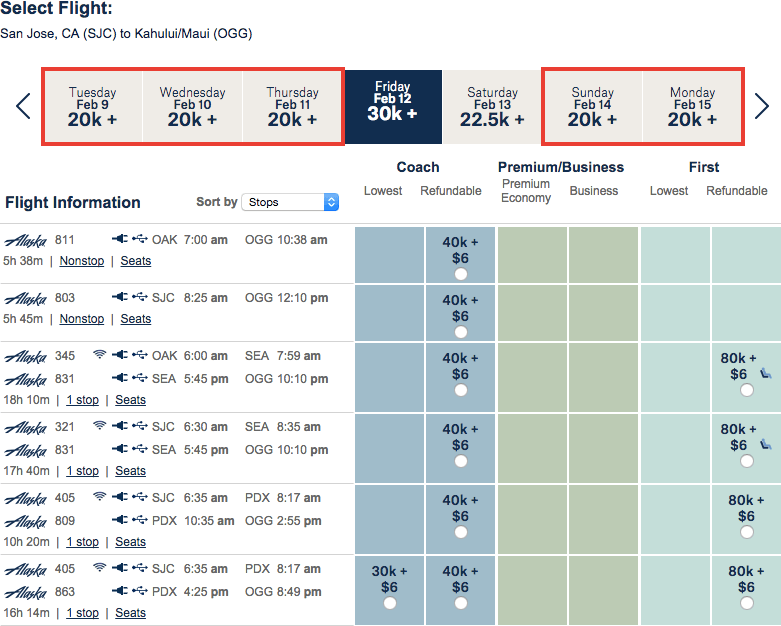 Fortunately, British Airways will waive the $25 call center fee because Alaska Airlines awards cannot be booked online. The Alaska Airlines website is the obvious, and fortunately also the best, tool for finding award space. It has a useful calendar to explore many dates at once, and the limited scope of Alaska’s network means no special tricks are needed to create complex itineraries. However, you will need to become familiar with the Alaska Airlines award chart to recognize which flights are available when redeeming Avios. Many of the awards that Alaska lists, even some that are displayed in the “lowest” category, are only provided to its own Mileage Plan members. Unfortunately none of the awards on February 12 can be booked through British Airways. For example, this calendar for an award from San Jose to Maui in February displays awards at 20,000 miles, 30,000 miles, and 40,000 miles one way. 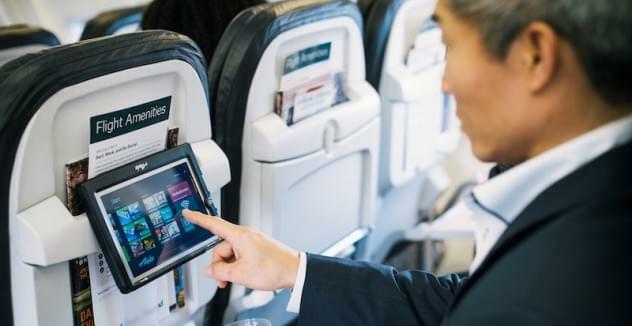 Both 20,000- and 30,000-mile awards will appear in the “lowest” category depending on which one is available, but only flights offered at 20,000 miles are actually offered to partners like British Airways. We’ll need to look at another date. Either review the one-week summary above, or click the link in the sidebar for a full month. Traveling earlier in the week when awards are just 20,000 Alaska miles will produce better results. 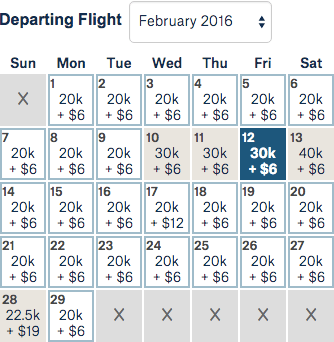 Remember that British Airways uses a distance-based award chart and prices each segment separately. Although Alaska may charge the same number of miles, connections will increase the cost of an award booked with Avios. Flight AS803 on February 2 should be available to book with Avios. 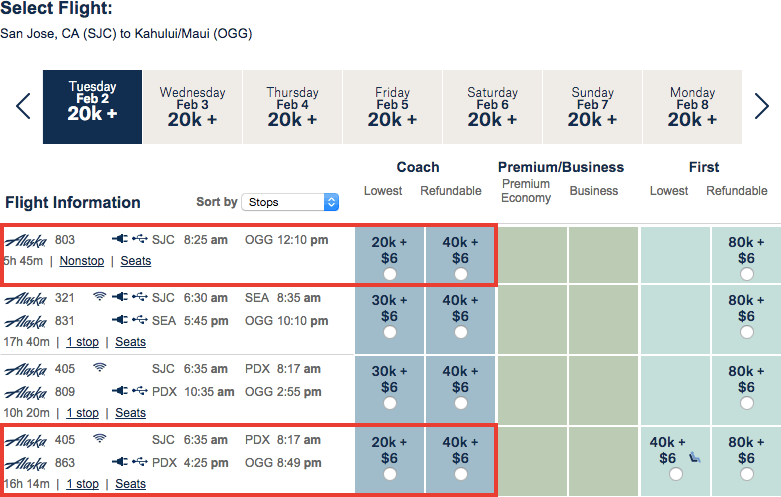 Flights AS405 and AS863 are also available, but this itinerary will be more expensive. If you live in a place like the San Francisco Bay Area or the Los Angeles Basin, you should click on the “All search options” link on the front page and let Alaska search other nearby airports in order to avoid connecting itineraries. You can also do this from the results page. Unfortunately the calendar function is not available when searching multiple airports. You can follow a similar process for travel to other destinations. Awards within the contiguous U.S., Alaska, and Canada can be priced at either 12,500 or 20,000 Alaska miles one way, but only the 12,500-mile awards are available to British Airways. If you happen to be searching for an award wholly within one state, you might see further discounts at 7,500 or 12,500 Alaska miles. Only the 7,500-mile awards can be booked through partners. As a fallback method, you can also search for Alaska’s award space on the American Airlines website. Any space made to one partner like American should also be available to British Airways—and those with more American Airlines miles may prefer to use them instead. 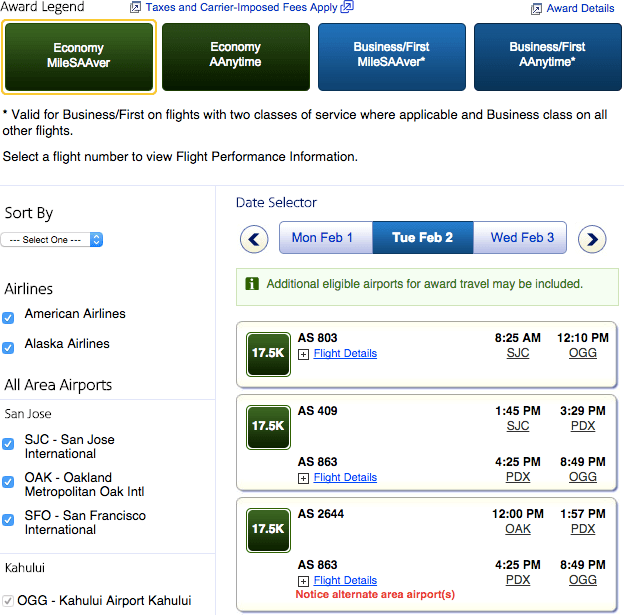 Searching on American will include nearby airports even when using a calendar. Once you have the flights you need—and hopefully it’s a non-stop itinerary—you can reach British Airways at 1-800-452-1201. Their call center is only open from 7:30 a.m. to 8:00 p.m. Eastern Time and frequently has long wait times. Be sure to call no later than 7:00 p.m., or use Skype to call one of the many international call centers at other times of day. Service is friendly; feel free to volunteer your flight information and remind the agent about waiving the booking fee if he or she seems unfamiliar with Alaska Airlines.